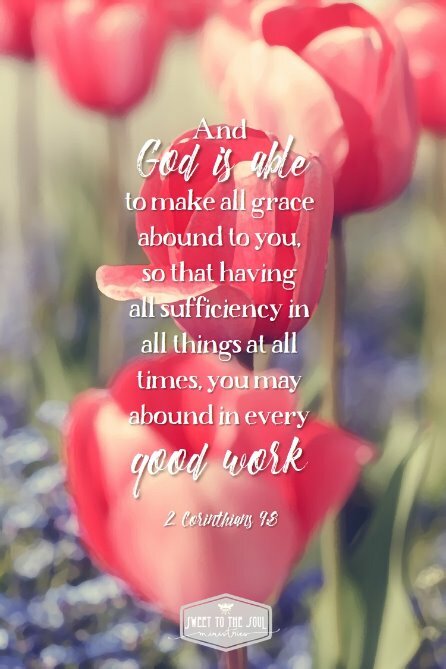 ​"And God is able to make all grace abound to you, so that having all sufficiency in all things at all times, you may abound in every good work." ​Dust swirled up behind me as the gravel stretched out in front of me. Yet another wrestling practice waited at the end of this long road. So many dusty miles! Countless trips to our small town 30 miles away. Time felt like an infinite well that was being tapped during that time in my life. My younger son was a wrestler. We decided to let him try it at a young age and see if he liked it. He did and he was very good at it! Even at 6 years old, the competitive nature of the sport and the drive required were right up his alley. His dedication made the long trips and hours waiting worth it. I loved watching him give everything he had to a sport he loved. I wish I could tell you every trip was an example of me being a cheerful giver of my time. Unfortunately, there were days I was less than stellar about giving my time and support. I mean, come on, my to do list was calling! Do you ever struggle being a cheerful giver? Personally, I find it’s easier to give what I have monetarily than it is to give of my time. The good news - you can’t out give God! This includes time, money, effort and opportunities. His grace abounds and provides everything we need so we can bless others. We give what we have, from a heart that is willingly. God blesses us with more than enough so that we can freely give and bless others. No hoarding allowed here. Is our time really our time anyway? Every good and perfect gift we’re given is from our Heavenly Father, including time. ​God shines in the tight places of our life. ​When we feel like there is no time to give others’ the first thing we need to do is talk to God about it. Is this something He called us to do or are we just filling our days with other people's’ callings? If we’re meant to help then we can trust God to orchestrate the time commitment as well. He makes us sufficient in ALL things at all times. This includes giving our time to that which He calls us. I get it...sometimes we feel like there are infinite demands on our time. How can we possibly give anymore? ​We can’t in our own power! Certainly not with a cheerful heart anyway. All those countless hours spent behind the wheel during wrestling, God more than made up for them. The blessings He showered on me with the gift of time with my son has been priceless. Any bit of time I did give, He gave back in a BIG way. Are you struggling to give your time, talents, finances or dreams to do the good work God has for you? Lean into the grace God is offering freely. He will provide more than enough for what needs to be done! Heavenly Father, I thank You for the grace you offer freely to us. Grace that expands to help us do the good works You have called each of us to. Help us to be cheerful giver’s of our time as well as every other good gift from You. Thank you for filling us up and for those blessings to spill over and bless others. By Your grace we can love and give freely to others what You’ve already given to us. We praise You for Your abounding grace! In Jesus name, Amen. Laura Hicks has a passion for family. She’s loved animals and sharing stories since she was young. She’s ranches with her husband and two sons way out in the middle of nowhere, or as she likes to call it – God’s country. 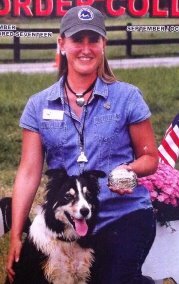 Laura trains Border Collie dogs to help on the ranch and compete in sheep and cattle trials. She believes that watching a good dog work livestock is truly poetry in motion! This is a great word of encouragement today, Laura! It's true that time is the one commodity that's hardest for me to give! I used to have a daily prayer walk, time to be quiet and reflect, but now that my daughter joins me, it's not such a "for me" time. I have to fit prayer into my day in other ways, but the upswing is that I'm getting special time with her on a daily basis. Worth it! After she leaves home, I can take plenty of walks by myself! Thanks Betsy! I'm so grateful for all the time I spent with my kids. God's blessings.